Home > Motorcycle decals > Kawasaki Teryx > Full graphics kits "panel wraps"
This kit replaces the factory decals and includes a matching set of tailgate overlays. We can put together almost any pattern or scheme that you would like. The sky is the limit with this kit as is with all of our designs. 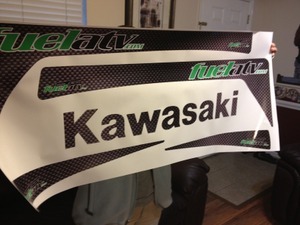 The images demonstrate a Carbon Fiber design with the owners company name included in the layout. Again, the sky is the limit with these kits. Simply send us an email to [email protected] with your design request and we will go from there to make your Teryx unique with your own design.